On January 4, 2008, Northern Soy, Inc. (“Northern Soy”) filed a trademark infringement lawsuit against Nathan's Famous, Inc. (“Nathan’s”) in the U.S. District Court for the Eastern District of New York. See Northern Soy, Inc. v. Nathan's Famous, Inc., Case No. 08-CV-00048 (E.D.N.Y). A copy of the complaint can be downloaded here. At issue is Northern Soy’s registered trademark NOT DOGS (for meatless links made from tofu) registered on August 4, 1987, but which Northern Soy claims first use in commerce on November 30, 1978. 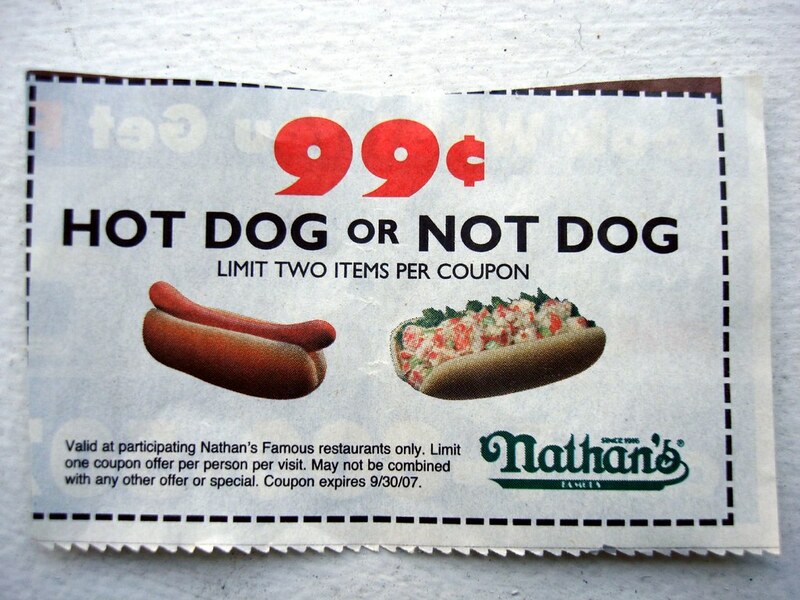 In the complaint, Northern Soy alleges that Nathan’s is using the NOT DOGS mark in connection with the sale of the “hotdog-like products featuring clam, lobster, chicken, and steak” on banners at its restaurants (see ad above), on the radio, and on coupons for its products (see below). Sometime in early November 2007, Nathan’s President and CEO, Wayne Norbitz, apparently spoke with Northern Soy’s President, Norman Holland, about Nathan’s use of the term NOT DOGS on its product and discussed working an agreement to use the mark. Northern Soy’s attorney wrote back to Norbitz on November 19, 2007, advising Norbitz to stop using the mark until such time as an agreement could be reached allowing Nathan’s to use the mark on reasonable, non-discriminatory terms. Norbitz subsequently had several phone conversations with Holland, apparently offering Northern Soy a one-time cash payment for unlimited use of NOT DOG. Holland declined this offer and no other agreement was reached. 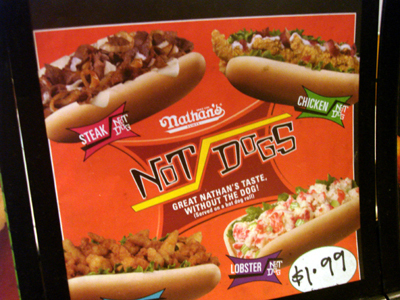 Northern Soy’s attorney again wrote to Norbitz on December 12, 2007, asking for confirmation that Nathan’s has discontinued use of the NOT DOGS mark in advertising and on products. Northern Soy alleges that Nathan’s is continuing to market, advertise, and promote food products using the NOT DOGS mark without Northern Soy’s consent or license. Northern Soy’s causes of action are for registered trademark infringement under Section 32 of the Lanham Act (15 U.S.C. §1114), trademark infringement under Section 43(a) of the Lanham Act (15 U.S.C. §1125(a)), dilution under New York law (NY Gen. Business Law §360-1), common law unfair competition, and deceptive trade practices under New York law (NY Gen. Business Law §133). Northern Soy seeks injunctive relief, an accounting of sales and earnings and a constructive trust on such earnings, an accounting of advertising expenditures, unspecified compensatory damages, treble damages, Nathan’s profits, and costs and attorney’s fees. Northern Soy may have a decent case here, but it is by no means clear cut. The Second Circuit applies the following eight factors known as the Polaroid factors in determining whether a likelihood of confusion exists: (1) strength of the trademark;(2) similarity of the marks;(3) proximity of the products and their competitiveness with one another;(4) evidence that the senior user may “bridge the gap” by developing a product for sale in the market of the alleged infringer’s product;(5) evidence of actual consumer confusion;(6) evidence that the imitative mark was adopted in bad faith;(7) respective quality of the products; and(8) sophistication of consumers in the relevant market. Polaroid Corp. v. Polarad Electronics, Corp., 287 F.2d 492 (2d Cir. 1961); see also Nora Beverages, Inc. v. Perrier Group of Am., Inc., 269 F.3d 114, 119 (2d Cir. 2001). In this case, the marks are identical and the products are similar (non-hot dogs) although Nathan’s will try to argue that Northern Soy’s meatless hot dogs are different than Nathan’s non-hot dogs which contain crab meat, steak, lobster, and chicken. I give these factors to Northern Soy. As for the strength of Northern Soy’s mark, it has been in use since 1978 and is incontestable under §15. However, as evidenced by Nathan’s use, the mark is also suggestive (i.e. a food product like a hot dog that is not a hot dog). Northern Soy may need to come up with some advertising or sales figures to make a case that its mark is strong. This factor is inconclusive at this stage, but leaning in Northern Soy’s favor. There is probably no evidence of actual confusion and it is doubtful that Northern Soy, with its obvious vegan market, will bridge the gap and develop a product similar to Nathan’s, which contain very non-vegan crab meat, steak, lobster, and chick. These two factors are inconclusive. The same is true for bad faith imitation. I doubt that Nathan’s was intentionally trying to imitate Northern Soy’s product, but instead, wanted a suggestive name to describe its non-traditional “hot dogs.” As for product quality, Nathan’s, which has been around since 1916, has a good reputation for its hot dogs, and as such, the quality of the products is not dramatically different. These two factors are also inconclusive. The sophistication of consumers in the relevant market could actually go against Northern Soy. After all, its primary consumers are likely to be vegetarians/vegans, who are very cautious about buying food products that are consistent with their vegetarian/vegan lifestyle. If they see NOT DOGS advertised that contain crab meat, steak, lobster, or chicken, they will likely recognize right away that it is not the Northern Soy tofu NOT DOGS that they know and love. On the other hand, Northern Soy could argue that a potential likelihood of confusion among its vegan customers could hurt Northern Soy’s goodwill in its mark because its vegan customers might be upset if they think that Northern Soy is now producing or somehow endorsing food products with meat. I would think, for this last reason alone, that Northern Soy would not want to license its NOT DOGS mark to a restaurant chain that will associate it with a different type of non-vegan fare with which Northern Soy’s customers have come to associate the mark. On balance, Northern Soy has a slight edge, but it’s by no means certain and there is enough room for Nathan’s to make a decent argument for no likelihood of confusion. How much has nathans offered for a one time cash settlement?